Cllr Andrew Muir: On Yer Bike Mr Mayor! I took my Mayoral Bicycle from Holywood to Belfast’s Titanic Quarter along with many others on Saturday 31 August 2013 as part of Sustrans United Kingdom wide “Pedal On UK” celebration of the completion of a £50M Big Lottery funded programme - “Connect2”- which opened up walking and cycling routes throughout England, Wales, Scotland and Northern Ireland. 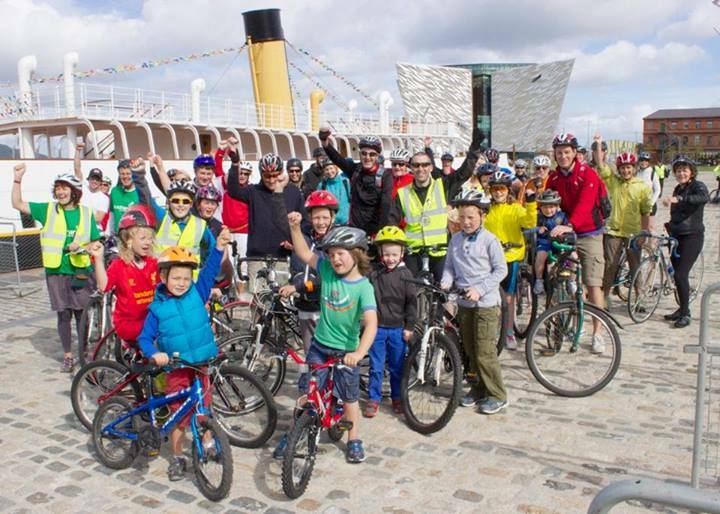 The Holywood cycle was one part of a four “spoke” Northern Ireland group of cycle rides on Saturday from Ballymoney, Newtownabbey and Comber into the Titanic Quarter. Sustrans held a lively range of fun cycling themed activities in the Titanic Quarter from noon onwards. As a keen cyclist, Sustrans Cycling Ranger and North Down Cycling Club Honorary member I was delighted to join other cyclists on the leisurely cycle to Belfast last Saturday. We were able to accommodate all abilities with cyclists aged from 6 to over 60 demonstrating how easy it is to get “On Yer Bike”! With more investment planned to accommodate cycling from Bangor to Holywood initiatives such as the Pedal On UK cycle ride help to raise awareness and put the wheels in motion towards the Bicycle friendly Borough many desire.